These are all manageable hazards. Solder contains lead, which is toxic. Do not breath the fumes. Adhesives, contact cleaner and similar chemicals should not be inhaled either. Read the labels. Ventilate the space. 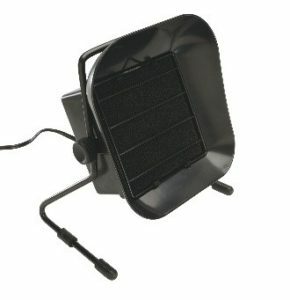 Consider purchasing a fume trapping fan like the one in this photo. Wash your hands after you have worked at the bench. Avoid finger foods while working. Solder is molten metal and it splatters. I have applied it to my bare legs, fingers and face. Not fun. As a result, I always wear eye protection and long pants when soldering.Soldering irons can, and have burned houses to the ground and scarred people for life. Youngsters and pets are very curious about them. Never leave an iron plugged in/turned on when you are not actually using it. If there are pets or kids, (especially young grandkids) at home, even as occasional visitors, find a way to keep soldering iron wires entirely out of reach. 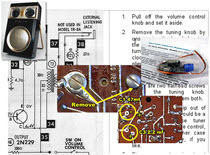 Although this is primarily a site about transistor gear, some tube equipment might find its way onto your bench as well. Examples include vintage test equipment, and that fifties table radio your uncle would really like to hear playing again. Electrocution is a rare, but unfortunate side effect of careless bench work. This is more of a risk when working with tube gear than with pocket radios, but any time you work around plugged-in, naked gadgetry and come in contact with ground, (via a water faucet or whatever), you run the risk of getting shocked. 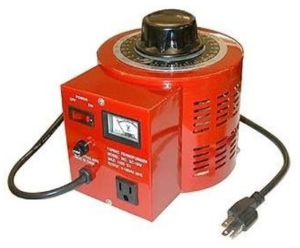 Power your bench from a Ground Fault Interrupter (GFI). 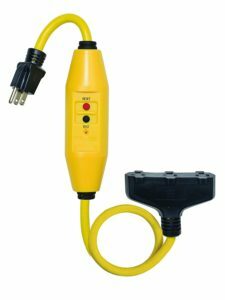 Amazon sells plug-in GFI cords like the one illustrated here, others that plug directly into wall sockets, or have a local electrician install a permanent GFI wall outlet. Unlike the electrolytic capacitors in transistor sets that just wimp out, in tube gear when the dry out they can explode, or even burst into flames. Never, ever leave unrestored vintage tube equipment of any kind powered up when you are not around to supervise it. 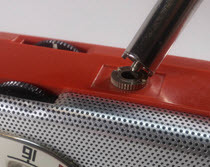 Whenever plugging-in old tube gear that has been in storage for a long time use a variable voltage transformer like the one here to slowly bring up the voltage over a 10 to 30-minute period. As mid-century tube equipment ages, this is becoming increasingly important. Slow power-ups will minimize, but not eliminate the risk of fire. Stay in the room while old radios are powered up. Have a fire extinguisher nearby. Polarized power cords are supposed to minimize this risk, but don’t count on it. The plug on the left is polarized. The prong on the left is wider than the one on its right. This is what you find on contemporary products. 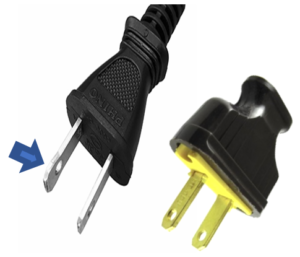 The plug on the right has two skinny prongs. These vintage plugs can be lethal! Whenever he could, my dad, (an electrician), used to work on live AC-powered equipment with one hand in his pocket.